Annie Baker has done it again. On the heels of her Pulitzer Prize-winning The Flick, her new play John, which is having its world premiere at the Signature Theatre, is yet another long (three-and-a-half hours!) slow fascinating novelistic play with a deceptively slim plot — two young people in a stormy relationship spend a cold winter’s night at a bed and breakfast in Gettysburg, PA – and a lot to say about life. On a meticulously perfect set by Mimi Lien, the play is impeccably staged by Sam Gold with theatrical touches suited to the wide stage at the Signature. Georgia Engel, whose low-key comic performance as the servant Marina in Baker’s adaptation of Uncle Vanya inspired Baker to write this play for her, quietly dominates the stage as Mertis (aka Kitty), the endearing and enigmatic proprietor of the B&B. The director has her draw the stage curtain open and closed herself, and he has her manually turn the grandfather clock’s hands to indicate the passing of time between scenes. It’s not accidental that the clock stands right in the center of the set. Time is at the center of the play – time as the ticking of minutes going by but also time in the form of history. It’s not a character but more like an element of the play, the air that it breathes. The air is thick with big themes that are not exactly stated but conjured like clues to a mystery that is never solved. One theme has to do with craziness, mystical experience, and ghost stories – are those the same, or different? Also love – same as craziness, or different? Another theme is Being Watched Over. Mertis likes to ask each of her guests if they believe they’re being watched. She’s not talking about surveillance or paranoia, Big Brother or the NSA. She’s sort of asking “Do you believe in God?” but as she’s talking we’re being also watched by an innocent/creepy line of teddy bears snaking up the staircase to the second floor. The great Lois Smith plays a very crazy character named Genevieve who’s blind and who believes that her ex-husband has been controlling her life. Jenny (played by Hong Chau, an excellent young actress I’ve never seen, with one of those high-pitched annoying baby voices) believes that her American Girl Samantha doll controls her. She is being heavily scrutinized by Elias (played spectacularly well by Christopher Abbott, looking and acting uncannily like Sam Gold), who hasn’t quite forgiven her for the affair she swears is over. Magic/spooky stories are told and magic/spooky things happen in the house — lights go on and off by themselves, the player piano plays on its own. Jenny turns into a statue at one point, so rigid that Eli can pick her up like a board and place her on the sofa. Kitty reads to Genevieve from a convoluted story that I recognized as H. P. Lovecraft (keyword: Cthulu). As for the title character: I don’t think I’m spoiling anything when I say that when Mertis speaks the last line of the play – “Who’s John?” – you both know and don’t know the answer, and that is simultaneously devastating, mystifying, and provocatively perfect all at once. Andy and I went out to Prospect Park for the closing show of the Celebrate Brooklyn series, Shabazz Palaces opening for Tune-Yards. The gates officially opened at 6:30 – we got there shortly after that and there were thousands of people lined up at both entrances to the park. Nevertheless, we managed to get good seats, on chairs! I was afraid we’d be stuck sitting on the ground. I have enjoyed checking out the first two albums by Shabazz Palaces, a band I vaguely understood to be a spinoff of Digable Planets, whose fusion of jazz and hiphop caught my attention back in the day. Shabazz Palaces turns out to be two guys (Ishmael Butler and Tendai “Baba” Maraire) shouting into microphones over a somewhat interesting soundscape that got completely obliterated whenever Butler detonated the bass loop on his synthesizer. Could not understand a word they said. At least on record they’re more intimate and compelling. Still, it was worth trekking to Prospect Park to see Merrill Garbus, aka Tune-Yards. She is really amazing to watch as she creates drum loops and then layers them with her (often double-tracked) vocals and sometimes ukelele. Her hot hot band included her right-hand man Nate Brenner on bass, a guy on keyboards, a guy on sax, another woman on percussion, and two female singers. The show hit an ecstatic peak two-thirds of the way in with a piece that turned into the most entertaining free jazz I’ve ever experienced. Garbus, Brenner, her keyboardist, and her sax player were all playing something wildly different, anarchic, chaotic, yet exciting, and then somehow precisely fell back into sync to finish the song. The high of that continued through her two biggest YouTube hits, “Water Fountain” and “The Bizness” (for both of which a line of young women behind us sang along at the top of their lungs – I love that Merrill Garbus is such a hero to them). 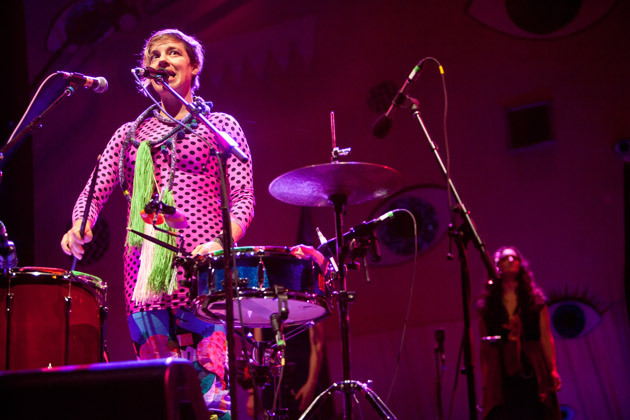 The long-lined chants, the chugging polyrhythms, the high-pitched women’s voices made me think that Tune-Yards is the spot where Fela Kuti meets the B-52s. But really, her music is pretty unclassifiable – it’s not sufficient to say Laura Nyro meets Talking Heads in Nigeria. She’s really original, especially when it comes to rhythm. Olivier Assayas’s film Clouds of Sils Mara is fascinating on many levels. First of all, I love a movie that doesn’t feel the need to (over)explain everything. Second, the relationship between the two main characters totally passes the Bechdel test. Valentine (a surprising Kristen Stewart) is the fast-talking smart American personal assistant to Maria Enders (glamorous and poignant Juliette Binoche), an internationally renowned movie star who made her splashy stage debut playing a teenager who seduces and abandons an older woman. Now she’s being asked by a hotshot European director (think Ivo van Hove) to play the older woman in a revival of the play opposite a hell-raising young starlet named Jo-Ann (think Jennifer Lawrence). The movie evokes and explores Maria’s complicated feelings about aging, the play, its recently deceased author, the characters in it, and the two young women (Valentine and Jo-Ann), not to mention the film industry and her place in it. Hollywood movies about movie people tend to either make fun of them or sentimentalize them. Assayas takes us inside the bubble that famous actors live inside, without commentary, viewing their concerns about publicity and making nice and avoiding photographers as matter-of-factly as they do. I also loved how the movie accurately depicted people’s casual but incessant dependence on their devices – mostly phones but especially iPads – in a way that no science fiction projecting into the 21st century ever accurately anticipated. This entry was posted on	August 11, 2015 at 7:34 pm	and is filed under Culture Vulture.